This agreement protects the interests of the client rather than the builder. It reduces the risk that the work performed is not up to standard, unfinished or not as agreed. It is suitable for residential property projects such as extensions, conversions, room layout changes, and kitchen or bathroom fittings. 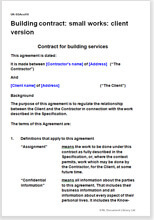 This contract favours the client rather than the contractor. It sets the terms under which work will be done on a residential property, whether that is fitting a new kitchen, building an extension, insulating a loft or installing a damp proof course. It reduces some of the risk that a building company or contractor you have never used before doesn't complete the work, or finish it to the standard you want. The document is structured so that the legal agreement is separate to the specification of work, which is in a schedule at the back. That makes the work to be done much clearer. As a client, you may not be confident to write the specification. If the contract value merits it, we advise that you use a quantity surveyor to write the specification. If you have to write it yourself, we advise you to use non-technical plain English language. Your contractor will benefit from general words because they give him or her flexibility. You need to use precise words so that you get exactly what you want. So make sure the specification states the details, whether that is what colour the facing bricks or roof tiles will be, what make of paint is used, whether safety glass is used, the type of radiator valves, and so on. Note: that this document is for work to residential buildings only. It does not comply with the HGCRA 1996 (the Construction Act 96) as amended by the LDEDCA, 2009 and governed by the "scheme for construction contracts", and therefore is not suitable for work to commercial properties, or large or grant aided projects. If you are the builder, then this contract is more favourable.